The climb begins with a turn. 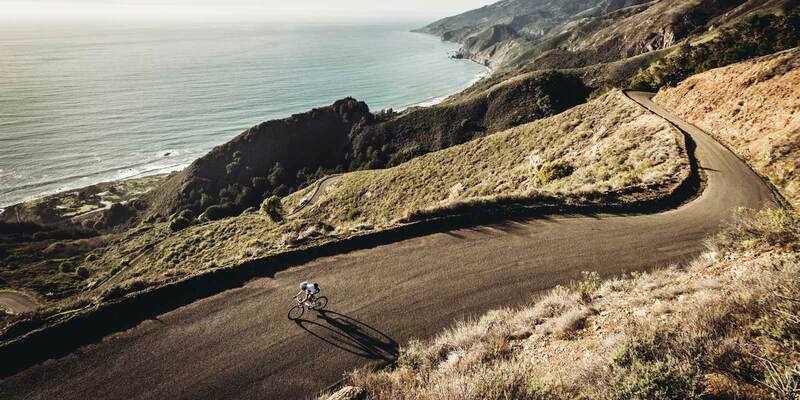 Most of the time, turns aren’t all that notable, but when you’re riding down Highway 1 along the Big Sur Coast, there are no turns. You ride north up the coast, or south down it. You don’t turn off of it. If you’re not looking for this one particular turn, waiting for it, expecting it—you’ll miss it. It’s just a quick little turn, nothing special, nothing to give away that it is not like most other turns. It’s a special turn. The turn from the main road onto Nacimiento-Fergusson Road opens the door to one of the most beautiful climbs I’ve ever had the pleasure to pedal. It rises rapidly from the cliffs along the coast, climbing into the sky, almost always with a view to the brilliant blue water and its white border between land and sea below. Toward the top, you leave the ocean view behind, but it’s okay, the ocean is replaced with wild fields, redwoods, flowers, and the kind of solitude we as road riders dream of. I’m generally a practical bike rider. I ride from home. I make loops. I never do out and backs, and I avoid driving to ride my bike at all costs. To climb Nacimiento, you’ll have to do both. It’s not close to anything. It’s approximately halfway between Monterrey and Cambria. From San Francisco, it’s a 200-mile drive; from LA, about 300. It’s remote. There’s no one here. We haven’t seen a car in a few hours. We take care of business first—the shoot—we’re in California to shoot Specialized’s new apparel line in some beautiful places. Nacimiento was tops on our list. We shoot until the last of the sun dips below the horizon. I’m a sunset guy, which means I just gave away a problem of ours: we sleep in late. I can count the times on one hand that I’ve been on a bike at sunrise, but it would take a city’s hands to count the sunsets I’ve seen on my bike. I can say with conviction that California is spoiled with its sunsets. The Pacific provides a tremendous stage for the sun to bow out in theatrical fashion each day, and we’re happy to stop shooting and just watch it. We took a picture during the shoot that probably looks staged, you know, that kind of catalog shot: two people looking peacefully out at the horizon. It wasn’t staged. From the lower slopes of Nacimiento, the setting sun demands to be watched—the whole scene demands to be watched. It was like a supermodel was catwalking back and forth to our right while we were trying to do our work. We couldn’t help but be distracted, staring out at something that looked far too perfect to possibly be real. How did we end up in this spot? How could it be that we got this lucky to be here working? It was a moment to just smile, laugh out loud at how crazy it all was, and enjoy it. When the last bit of orange faded, we jumped into frenzied action. Work was over, it was time for play. I’ve always loved riding in the gloaming, that time between sunset and the last of the light. It’s a special time, a time of quiet. For some reason, these times have always been a time of thought for me. I can’t explain why I get all introspective as the light goes away—maybe it’s because my life is in danger. After spending a lot of the year on the road, it’s easy to end up feeling lonely and isolated. Last year’s 10 months in Europe brought a general feeling of tiredness—tired of moving, tired of being a stranger, tired of being mostly alone, tired of being tired. I can’t complain though. I know I’ve pulled an amazing card, and I don’t ever want to take it for granted, but that doesn’t mean that there isn’t something to be said for home, hanging out with friends, and not being a foreigner. So this is where our male model and great friend Jonathan comes in. With our shoots now, we often get the chance to chime in with ideas on where to go, and if we’re lucky, we get to find the models as well, which usually means friends. We laugh, we work, we shoot, we have fun, and we play—it’s perfect. Jonathan is an ornithologist and bike racer. For a week, he got to play the part of the male model, for which he fits the written bill perfectly: he’s between 6’0 and 6’2, wears a 40-regular suit coat, and has a positive attitude. It is true, he looks the part: tall, broad shouldered, strong, not too hard on the eyes, but best of all, he’s a friend. Jonathan and I set off from the car, pedaling easily, leaving the day’s work behind and below. We talk. I always talk on the bike. I can’t help myself. There’s something about pedaling that makes me talk. Preferably in time with my cadence. At 90 rpm, I’ll need at least 90 words per minute. Jonathan, for all of his outward appearance as a quiet person, is anything but. Speaking in levels scarcely above a whisper—some might call it a mumble—Jonathan can go on and on, and bring the laughs. We get along famously. When Ashley meets us at the top, she asks what we had talked about. I shrug, “Nothing, really.” I felt like a kid who comes home from school and is asked, “What did you do at school today?” Nothin. At the time though, our conversation felt so real and important and profound, but standing in the darkness at the crossroads at the top of the climb, I couldn’t remember anything. There were no specifics that came to mind, just a general feeling of happiness and contentment. I guess it’s a secret of the ride. I feel like I have post-exercise amnesia, but maybe it’s better that way—it keeps those conversations, those fantastic moments, only available to those that partake in the ride. It’s okay, though. It’s not an exclusive club, everyone is welcome. Since I can’t tell you what we talked about, a smile will have to suffice. We also want to stomp each other. It’s nothing personal, but between talking and laughing, we gradually go harder. We are bike riders. We pedal this perfect road, shoulder-to-shoulder, shifters creeping slowly in front of the other, then a bar, then half a wheel. The other responds, draws even, puts a shifter out front—game on. We talk, but the conversation is gradually drowned out by our breathing. We do our best not to show the welling pain. You can’t see much at this point though, our vision hits its limit at about our hands on the bars. With the disappearance of vision, I feel my ears strain with my legs. It feels like I hear everything. I can hear the sound of the tires on the pavement, the click of the shifters, the slight squeak in my left pedal, the sound of a jersey being zipped up, a helmet adjusted, the gentle applause of the wind in the leaves, the pebbles beneath our wheels, and the breathing. It’s deep, but measured. Not haggard. Not yet at least. We push each other. I want to drop him, just as he wants to drop me. Why have awesome friends if you can’t put on your boxing gloves every once in awhile (or every day) and throw down? It’s nothing personal, except we’re friends, and it always feels good to put some open road between my wheels and a friend’s. At least for a moment. Then the dropped guy taps out, the victor slows, smiles, we laugh about the duel, and carry on, chatting. Smiles. Each of us hates to tap out, but it’s always with a smile and a shrug. Next time. It’s all worth smiling about. It’s just too fun not to smile until your cheeks hurt, and you can feel the salt crinkle on your face. That night, an idea hit me, an idea that would crystallize over the next few weeks. It was so simple, so basic as to seem ridiculous. I love riding my bike. Let me emphasize that: I really love riding my bike on awesome new roads with friends. I learned this lesson late, but in my new life as a hobbyist, I want to seek out friends on the bike. I want to share and talk and laugh and be dumb and come home exhausted, ready for more, excited about the next day’s adventure. There’s no better bar than outside, no better bar stool than my bike, and certainly no better beverage than a long, long ride with friends. As we shut the doors on our rental van and set off back down the mountain headed for Santa Barbara, I look to the left and right. Two roads depart the civility of the pavement for the wilds of dirt. I take a closer look later at the map and see how they extend seemingly forever. Dirt—as far as you care to ride. There has to be a second part to this story, one where we return, four or five of us, ready to ride, ready to laugh, ready to hurt, ready to love being a bunch of kids on bikes, just playing. From Issue 20. Buy it here.